Less than a year after the launch of the Carrera Heuer 01 in-house chronograph, the new generation of Carrera incorporates a chrono plus a flying tourbillon. The Carrera Heuer 02-T is entirely designed, developed and produced at the Manufacture TAG Heuer. 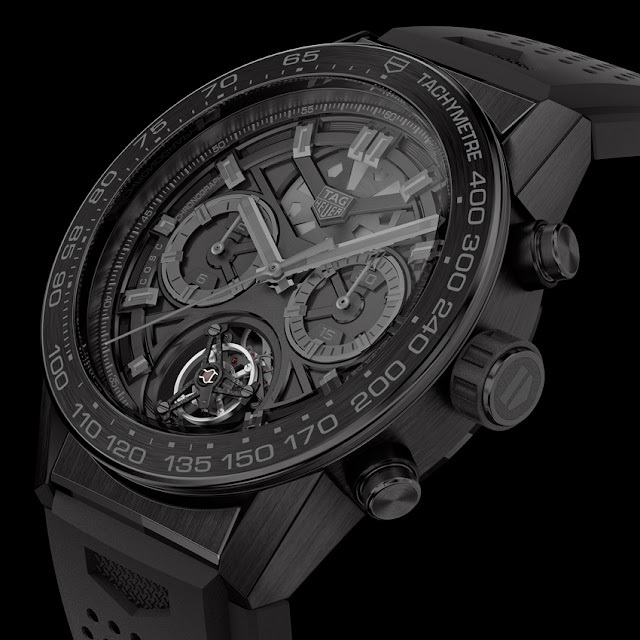 For the Black Phantom model, the new Carrera case, made from 12 separate modular parts, is fashioned from black titanium. It houses the very latest TAG Heuer calibre, the Heuer-02T. This chronograph movement is directly inspired by the CH-80 and is COSC-certified. Here, it combines with a tourbillon regulator that stands out for its black and grey design, its lightness thanks to the use of titanium and carbon, and its flying construction. This new timepiece naturally shares the skeletonised, sleek, contemporary design of the new generation of Carrera watches, with its skeleton bridges, openworked hour circle and geometric bridges. The Carrera Heuer-02T Black Phantom is a 250-piece edition and positioned, amazingly, at under CHF 20,000. Mechanical automatic, COSC-certified HEUER-02T calibre, flying tourbillon with titanium and carbon cage, 28,800 vib/h, skeletonised bridges, power reserve in excess of 65 hours. Hours, minutes, seconds on the tourbillon, date, chronograph, tachymeter. Grade 5 black titanium, 45 mm. Sapphire crystals, front and back. Water-resistant to 100 metres (10 bar/330 ft). Black skeleton. Black hands, hour-markers and counters, 30-minute counter at 3 o'clock, 12-hour counter at 9 o'clock. 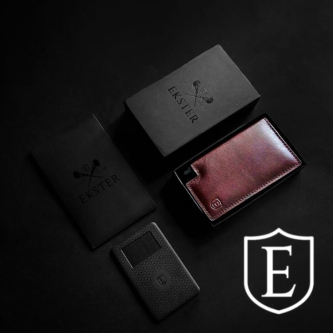 Mat black alligator on black rubber, titanium folding clasp. Grade 5 titanium case and black titanium bezel with skeleton dial, silver hands and counters. TAG Heuer, the Swiss Avant-Garde watchmaker since 1860. Avant-garde is in our culture and philosophy. Our unique heritage is built on pushing boundaries and breaking rules: harnessing mental fortitude to overcome technology restraints and create daring luxury watches with real racing spirit and a performance touch. The brand has marked the history of watchmaking, especially in the field of chronographs with an unequalled mechanical accuracy. With Jean-Claude Biver, CEO of TAG Heuer and President of the LVMH Group Watch Division at the helm, the 2015 models reveal a new dynamic in terms of both the fast lead times and a completely transformed environment. TAG Heuer is currently the only watch brand to be able to communicate in the four different worlds: Art, Lifestyle, Sport and Heritage. Our partnerships (Bundesliga, World Surf League & Big Wave Tour, FIA Formula E, Monaco Grand Prix...) and our ambassadors, living football legend Cristiano Ronaldo, it-girl Cara Delevingne, American Quaterback Tom Brady, actor Chris Hemsworth, DJs David Guetta & Martin Garrix, Chinese singer GEM & actor Li Yifeng, tennis superstar Maria Sharapova… they all reflect common core values of mental strength, disruptive attitude and ambition. Our slogan #DontCrackUnderPressure is far more than a claim - it is a mindset. 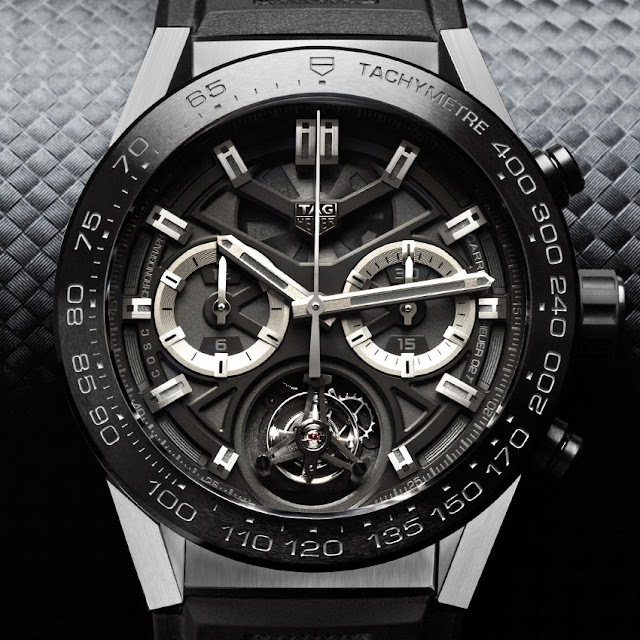 TAG Heuer is part of the LVMH Group.